24 July 2018 – London, UK – Asset and service data are playing a much more critical role in Oil & Gas businesses than previously thought. 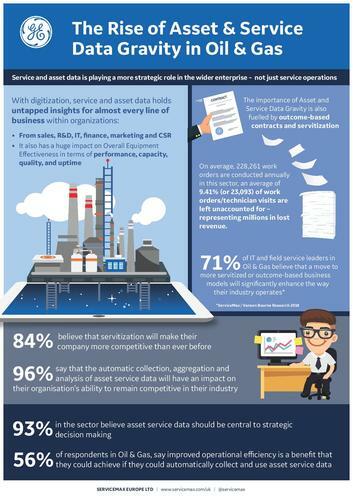 With digitization, service and asset data holds untapped insights for almost every line of business, according to new global research, “The Rise of Asset and Service Data Gravity”, conducted by Vanson Bourne, commissioned by field service management specialist, ServiceMax from GE Digital. The move to servitization – also known as outcome-based services – is also fuelling the importance of asset and service data. Eighty four percent of oil & gas organizations believe servitization will make their company more competitive. ServiceMax leads the massive global industry of field service management software -- an $18 billion market worldwide. The company continues to reimagine and create solutions for the 20 million people globally who install, maintain, and repair machines across dozens of industries as the only provider of complete end-to end mobile and cloud-based technology for the sector. ServiceMax goes to every length -- from joining technicians on service calls to publishing the industry's leading online publication -- to help customers discover untapped innovation, unleash new revenue streams, drive efficiency, and most importantly delight their end-customer. To learn more, please visit www.servicemax.com.